It is not to be confused with Agave americana, sometimes known as American Aloe. It can cause gastrointestinal cramping or contractions, so is contraindicated during pregnancy. It should not be used internally by those suffering from intestinal obstructions, kidney disease, colitis, and intestinal inflammations. In rare cases, heart arrythmias, kidney abnormalities, edema, and accelerated bone deterioration may occur. Do not use the bitters on the skin. Use as a laxative for only ten days at a time as long-term use can cause a loss of electrolytes, particularly potassium. Note that many “aloe” laxatives also contain senna, which is harder on the system and often, the real cause of the effectiveness of the laxative. Read the labels carefully. If aloe is not listed as the main ingredient, it is best to avoid that product. Care must be taken when using many commercially prepared products that contain “aloe” as usually there is not enough included to be of much value medicinally. Native to eastern and southern Africa, aloes are now commonly cultivated worldwide, especially as houseplants. There are about 350 species of these perennials that also grow in the tropics, including Central and South America, India, and the Middle East. Aloes generally have prickly, gray-green succulent leaves that can reach a length of two feet and producing spikes of yellow or orange flowers. 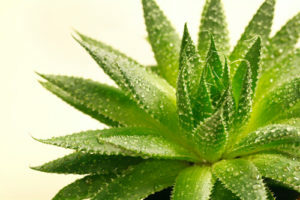 The leaves contain two different fluids — the inner portion is filled with a clear gel and the thick aloe skin contains a bitter yellow juice or latex. Aloe has been used medicinally for more than 3500 years. Egyptian texts, dating to about 1500 BCE, describe its healing properties. Alexander the Great used it to treat wounds. Greece, Rome, China, India, West Indies all used it as a wound healer, laxative, and purgative. Cleopatra is said to have attributed her beauty to it. About the 6th century CE, Persian traders carried aloe throughout Asia. Marco Polo witnessed healers in the Orient using it. A beautiful violet dye is produced from aloe plants (A. perryi) native to the island of Socotra in the Indian Ocean. A desire for the plant is said to have motivated Alexander the Great to conquer the island in the 4th century BCE. 1400 years later, Muslim traders reported the island was still the only source of the herb, although it is now grown in Africa, China, India, and Central America. The Spanish called the plant sábila after the Arabic word, saber, which means patience. The implication is unclear. Even before the conquest of Mexico, aloe was heavily cultivated on the island of Barbados, leading to the naming of one botanical variety, Aloe barbadensis. Similar to the maguey, aloe is often confused for that plant. Even Columbus assumed that he had “discovered” aloe, a plant he was familiar with in Spain; but it was actually a maguey which he took back with him. Related species are used as an antidote for poison arrow wounds. The anthraquinone glycosides (aloin and aloe-emodin) are strongly laxative and can cause uterine contractions. This is the reason that aloes are contraindicated internally during pregnancy. These substances are not found in high levels in potted plants. Aloectin B stimulates immune system. The gel is made up of some seventy-five complex substances known to date. Many are made up of bioactive ingredients. Aloin is a stimulant for peristalsis. However, in high doses, aloin will act as a powerful purgative with the effects lasting up to twelve hours. It has been proven effective against Stapylococcus aureus, Pseudomonas aeruginosa, Herpes simplex 1 and 2. In general, the gel is used externally. The latex is dried and used in oral drugs, mostly laxatives. There is also a standardized aloe extract, derived from freeze-dried aloe gel that can be taken internally. Some form is commonly found in all manner of beauty treatments: lotions, shampoos, creams, suntan lotions. When needed, fresh leaves are generally snipped off, opened up, and the gel applied to the affected area on the skin for minor burns, scalds, or sunburns. This gel also helps speed the healing of cuts and other minor wounds; helps prevent scarring; reduces tissue damage from frostbite; relieves skin irritation and inflammation from stings or bites, treats external hemorrhoids; and moisturizes and softens dry, itchy, or rough skin. Internally, the aloe latex juice is used to treat constipation, but care must be taken as too much can result in it being a purgative. See cautions above. Research is indicating that its use internally has an antifertility aspect inhibiting ovulation in rabbits and rats. Although numerous tests have indicated that when aloe is used externally, it helps wounds heal, decreases inflammation, and relieves pain, it can also delay deep wound healing including that of surgery. The powdered gel extract is taken internally to treat ulcers and other intestinal problems including diverticulitis and inflammatory bowel disease as well as to bolster immunity. The latex contains bitter substances that increase bowel motility and loosens the stool. These actions are derived from compounds in the resin which stimulate bowel contractions and helps increase the amount of intestinal fluid resulting in a more watery stool that is propelled rapidly through the colon. For this reason, aloe should not be used on a regular basis as this rapid propulsion dramatically affects the time needed to absorb valuable nutrients into the system. Chinese medicine uses aloe to treat fungal diseases. South Africa uses it for eye inflammations and syphillis. Aloe and honey are two of the more powerful substances that can be applied externally to speed wound healing and prevent infections in burn victims. One especially important aspect is that both are liquid. This allows them to keep the burn tissue moist, soothe the damaged tissues, and restore lost body fluids directly through the skin, which is generally a problem for burn victims. At the same time, they are potent anti-inflammatories and antibacterials and it is nearly impossible for a staph infection to get started with these two substances present.